Recently, Play Store developers are informed about the new updates in the policies — tech giant decided to prohibit cryptocurrency mining apps on their platform. All applications which are designed to mine digital currency on the device are banned except those who focus on cloud-based mining features. Even though there are legitimate crypto-miners, such as MinerGate, the company aims to protect its users from deceptive applications which can lead to potentially dangerous consequences. It is evident that some descriptions might be misleading and fail to clearly identify cryptocurrency mining activities which are performed in the background. Following April, Google has also banned all Chrome extensions which were developed to mine digital currency, such as Bitcoin, Monero, Litecoin, Ethereum, ZCash, etc. These Chrome Web Store modifications were implied when the company found out that more than 90 percent of the extensions failed to inform their users about crypto-mining activities. James Wagner, product manager at Google Extensions platform, noted that the majority of extensions contained cryptocurrency mining scrips stealthily embedded into the source code and neither informed the users about it nor asked their permission for such actions. These restrictions should significantly decrease crypto-jacking attacks which also fall into the category of Android virus. Security researchers identify that these malicious actions have reached the increase peek of approximately 45 percent during the last year. Thus, these numbers should at least stay if not fall after the new restrictions by Google. ^ Aayushi Dhawan. Cryptocurrency mining apps banned on Play Store by Google. CoinFrenzy. Blockchain and Crypto News in Shorts. ^ Filip Truta. Google Play Store no longer accepts crypto-mining apps. HOTforSecurity. The blog on the sizzling world of computer security. ^ Angela Moscaritolo. Cryptocurrency Mining Apps Banned From Google Play. PCMag. Technology Product Reviews, News, Prices & Tips. ^ Dani Deahl. 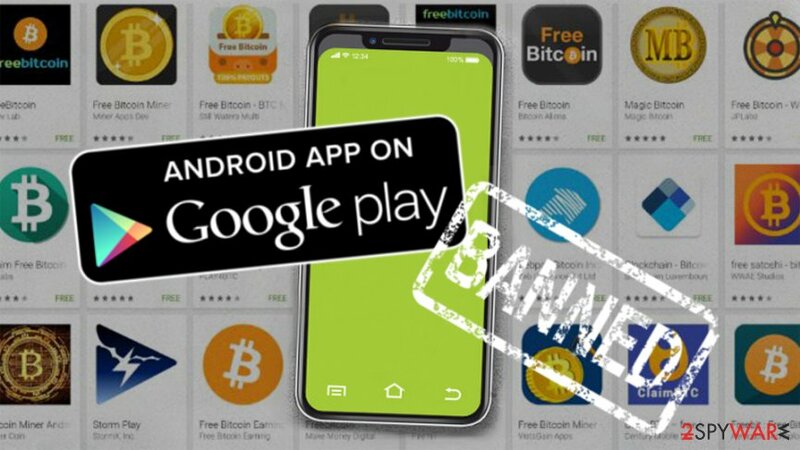 Google bans cryptocurrency mining apps from the Play Store. The Verge. Technology, science, art, and culture. ^ Jake Doevan. Android virus. How to remove? (Uninstall guide). 2Spyware. Security and Spyware News. This entry was posted on 2018-07-30 at 06:53 and is filed under News, Security.